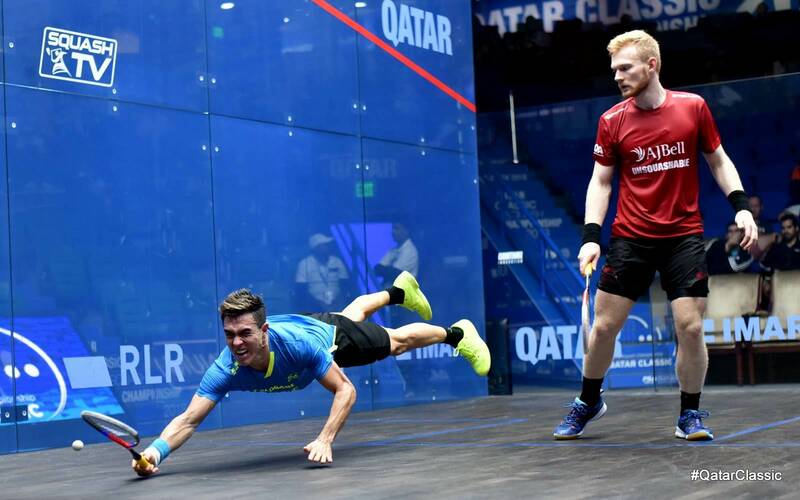 Joel Makin provided the first major upset of the Qatar Classic after dispatching fifth seed Miguel Angel Rodriquez in the longest match of the tournament so far. It was definitely not an easy day for the seeds as sixth seed and 2016 champion Karim Abdel Gawad and second seed Ali Farag both did just about enough to scrap through. Tarek Momen, the player on form after winning in St. George’s Hill, meanwhile had a straightforward passage today. Makin was controlling the backhand side wall with such precision and his volley drops on that side had troubled the Columbian cannonball repeatedly. In the fourth game, Makin was clearly unhappy that play had to be stopped halfway through a rally after Rodriguez had dived and soiled the court, when he was in an attacking position. The Welsh number one had an opportunity to close the match out in the fourth having gone to 10-9, but the stubborn Rodriguez saved that with a low backhand kill, before winning the next two rallies to draw level. In the decider, it was Rodriguez who was in the driver’s seat having broken away to an 8-5 lead. But Makin came back calmly and eventually closing the match after Rodriguez sent a return of serve into the tin. “It was tough out there. I knew what to expect from him. I’ve seen lots of his matches. I sort of stuck through the plan of getting the ball high and long into the back getting that extra height especially on the backhand. I knew if I got it round to the front too much he would be too good. 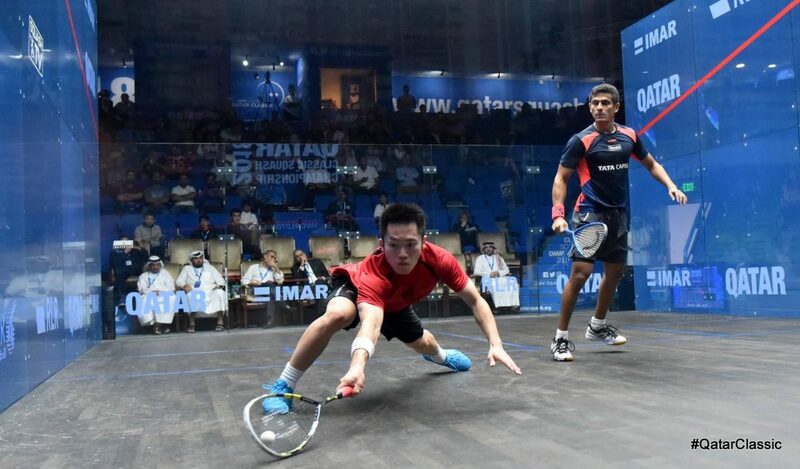 He’s quick and he’s got good hands, he reacts to it quite well in the front,” said Makin, who has beaten two top ten players in as a many weeks, having beaten world number one Mohamed ElShorbagy in St. George’s Hill. Karim Abdel Gawad, notorious for his slow starts, nearly fell victim to his trait after falling 2-0 down to Malaysian youngster Ng Eain Yow. 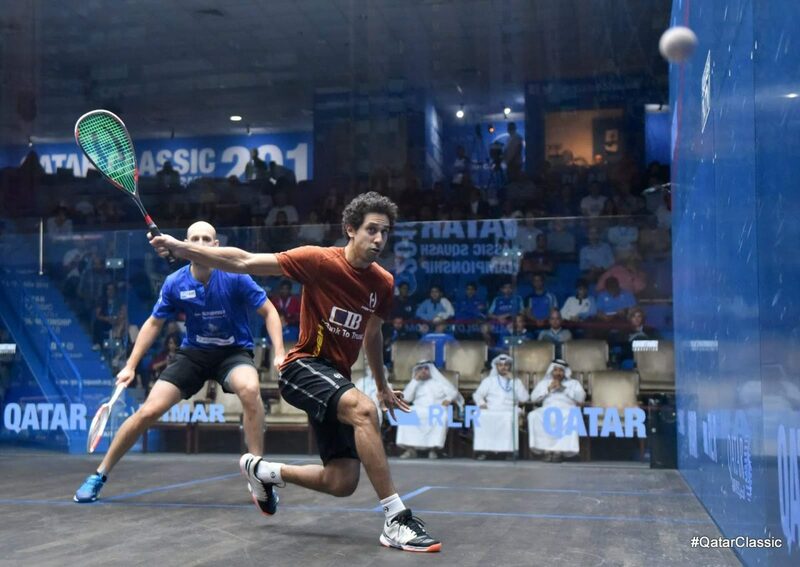 The former world junior champion, who took out local favourite Abdulla Mohd Al Tamimi two evenings ago, played brilliantly in the first two games and controlled much of the rallies in the first two games. However, he allowed Gawad to claw back to 9-9 in the second game after leading 8-3. While Ng eventually won that game, the rallies leading up to that allowed Gawad to finally get his rhythm working. This was evident, as in the next three games, Gawad was in total control and the 20 year old from Kuala Lumpur simply had no answer to Gawad’s barrage of shots. “It was not easy at all. Coming back from 2-0 down against anyone is difficult, what more against a player like him today. I knew it was going to be hard. He was the world junior champion and no one can be one if they weren’t good. So I knew it was going to be tough and I am glad I got through of course. “After falling to 0-2, I tried to push mentally as much as I can. I tried not to think of the score so much. I tried to not just play my squash but to play a game that I needed to win especially when I am not playing that well today. I am glad I found a way and pushed through that,” a relieved Gawad said. In the final match of the evening, Egyptian Ali Farag edged out good friend and compatriot Mohamed Abouelghar in five high quality games. It’s almost unbelievable that the pair, both ranked in the world’s top ten, are playing at such an early round of a Platinum event. Playing to a packed gallery, the pair certainly lived up to the hype and expectations of the audience. 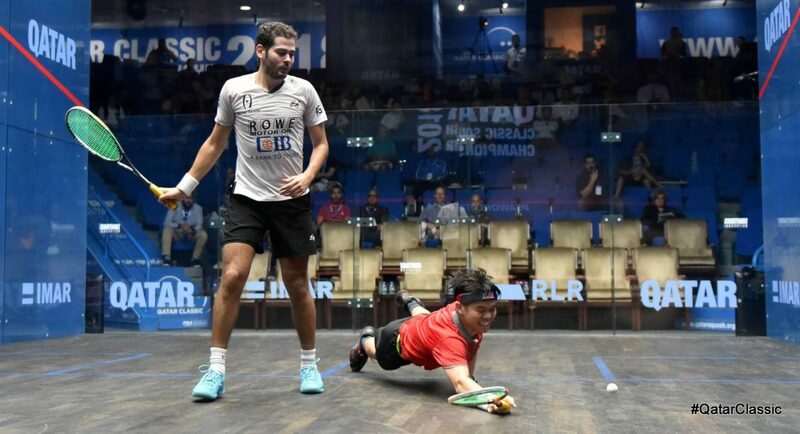 The precision of Abouelghar’s attacks were inch perfect, which was matched by Farag’s unbelievable retrieving skills. This could well be match of the tournament as the bar has been set very high by these guys. “It was very tough from the very beginning. Mohamed is a very talented player and if you give him any loose balls he’s going to go for it. He showed it in the first game. I was 9-6 up and I don’t think I did much wrong, but he went for his shots and they went in. I was just happy to contain him in a way. On this court, it’s particularly rewarding at the back corners, and I took advantage of that. 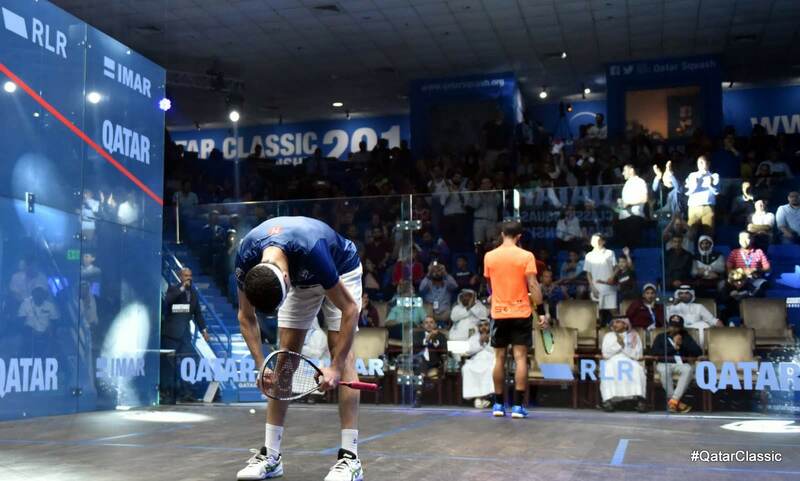 I’m just happy I manage to keep my nerves at the end to get that win,” a relieved and happy Farag said after. In another shocker of the day, Saurav Ghosal trounced Asian rival Leo Au of Hong Kong in the shortest match of the day. The pair had last met in August at the Asian Games semi-final which Au won in 73 minutes. But it was totally the opposite today as Ghosal never really allowed Au to get into the game. He dropped just 10 points in total and wrapped the match up in less than half an hour. “I executed what I wanted to do the majority of the match. That helped obviously. I hit my targets consistently both at the front and to the back so I’m happy about that. It’s a really good win and a good score against someone of his calibre,” said Saurav. The 2005 champion, James Willstrop, overcame Hong Kong’s Max Lee in four games. The lanky former world number one, from Yorkshire, had to dig deep to withstand the quick Lee. Today, it was the quality of his lobs and accuracy of the drops that won the match. Declan James, Mathieu Castagnet and third seed Tarek Momen all won their matches, removing Karim Ali Fathi, Cameron Pilley and Nicolas Mueller to advance. “I’m very pleased with my performance today. Nicolas is a very tricky opponent so a 3-0 win against him is a bonus. The last time we played, it was very close and today I felt I played really well and managed to close out the games each time. “I’m trying to carry it (my form from Channel VAS) with me. I’m trying to relive the moments, like visualise how my mental state and tactics was during that time. I’m really hoping to follow that up with another good win here,” Momen said when asked if he felt he was playing at the same high level he was when he won the Channel VAS event two weeks ago. Momen now meets Willstrop, with the winner scheduled to meet either Castagnet or Makin. A trio of English outsiders face formidable challenges in the second round, with Adrian Waller tackling top seed Mohamed ElShorbagy, Tom Richards facing Simon Rösner and James up against Gawad. On a mouthwatering menu, one potential blockbuster features Egypt’s mercurial Mazen Hesham up against Diego Elias of Peru. Men’s Qatar Classic, Khalifa Sports Complex, Doha, Qatar.